The way vehicle tax is calculated will be changing for new cars and some motorhomes from 1 April 2017. Time is flying by and we’re just 50 days away. Over the past 12 months we’ve been working closely with stakeholders to make sure they’re aware of these changes. We’re changing the tax rules ready for 1 April and are developing a new service to register new vehicles to launch later in the year. To support the changes we set up and attended industry steering groups to hear the views of stakeholders, update progress and agree the changes. We launched our public facing communications in November 2016 and have been informing customers about the changes. This publicity campaign is being run across social media, blogs as well as through messages on DVLA literature. We’ve also updated GOV.UK with the facts about the changes. DVLA’s contact centre is running an automated telephone service to quickly answer our customer’s questions. We also hosted a webinar in January for fleet customers with commentary provided by DVLA Service Designers Helen Jones and Rhian Townsend. We’ve been keeping a close eye on how these communications are performing and what people think. From this we know that the most popular query amongst the public is whether these changes will affect existing vehicles. The answer? No they don’t. The new rates only affect cars and some motorhomes first registered with DVLA on or after 1 April 2017. 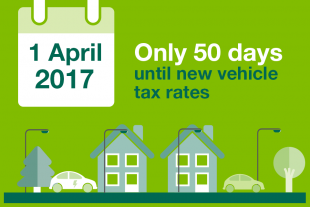 So, the countdown is well underway with only 50 days to go until the new vehicle tax rates come into force. I’m sure this will fly by so please keep up to date with this topic and others by following DVLA on Twitter, Facebook and LinkedIn and subscribing to our Digital Services Blog. Is this REALLY the way to encourage Joe Public to drive low emissions vehicles??? There are no changes to tax for vehicles registered before 1 April 2017. For more information see https://www.gov.uk/government/news/new-vehicle-tax-rates-from-1-april-2017. It would have helped if they had told us what the new tax are? This post is useless. Where are the details. Secretly hidden away? I still have no clue as to what the new tax laws are??? I suppose this is a revenue gathering operation!! The honest motorist is once again going to have to bail out this underfunding Tory government. All very well, but where can I find the new rules; your website is sending me round in circles. This is more likely to encourage people to keep hold of their old cars to avoid paying the increased VED rates on newer models. That's if the average motorist is even aware that the changes are taking place! I have a feeling that this is going to come as a nasty shock to a lot of people.